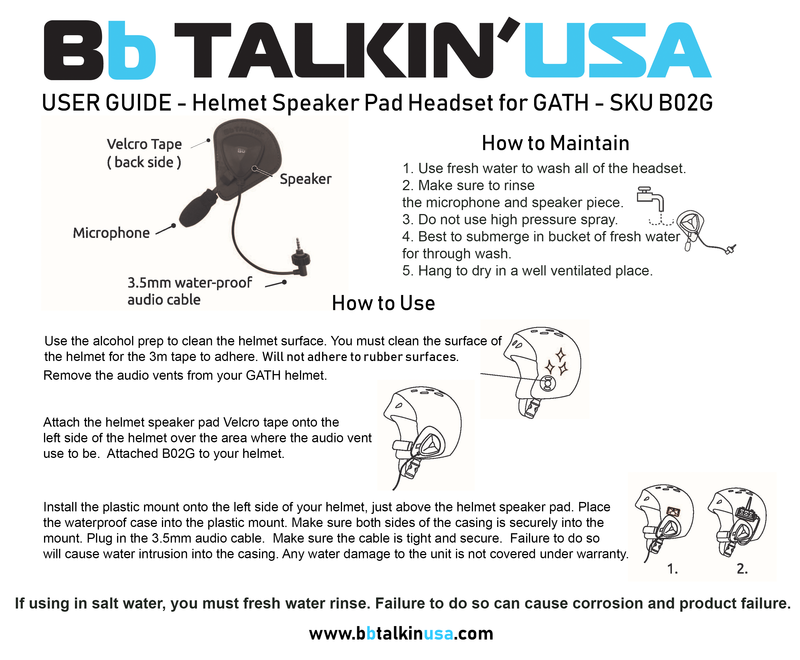 Single sided helmet speaker pad with microphone for your GATH helmet by BbTALKIN USA. This helmet pad is designed to be used with our Advance Unit. You plug the boom microphone’s 3.5mm audio cable directly into your Advance Unit to establish communication. The microphone and speaker piece on the helmet pads are completely waterproof. The design of the helmet pad allows the flexibility to change out either the microphone piece or speaker piece if it becomes damaged over time. This pad fasten to the left side of your helmet by a marine grade Velcro. These are compatible with all GATH helmet’s that have full ear protection. They are not compatible with the GATH Gedi helmets. From the date of purchase, the helmet speaker pad and all it’s components are covered for 6 months. Please see our warranty section for complete warranty details. 2. Remove the audio vents from your GATH helmet. 3. Attach the helmet speaker pad Velcro tape onto the left side of the helmet over the area where the audio vent use to be. 6. Plug in the 3.5mm audio cable. Make sure the cable is tight and secure. Failure to do so will cause water intrusion into the casing. Any water damage to the unit within the casing is not covered under warranty.